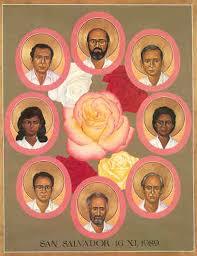 Twenty-five years ago today (November 16th), six Jesuit priests and professors at El Universidad de Centro America (the University of Central America or UCA) in San Salvador, the capital of El Salvador, were brutally murdered along with their housekeeper and her daughter. The priests were: (1) Ignacio Ellacuría, the Rector of the University; (2) Ignacio Martín Baró, an UCA social psychologist whose research focused on the psychic problems of living in a context of structural violence; (3) Segundo Montes, an UCA anthropologist interested in the effects of social stratification and displaced victims of the country’s civil war; (4) Amando López Quintana, the chair of UCA’s philosophy department, a parish priest and director of a mass-literacy campaign; (5) Joaquín López y López, director of UCA’s Fe y Alegria (Faith and Joy), a vocational training program for impoverished youth; and (6) Juan Ramón Moreno, who served at UCA’s Center for Theological Reflection, which addressed questions of faith and justice. “On the grass a few feet from the residence lay the forms of four bodies covered with white sheets. What appeared to be blood stained some of the sheets. . . . Subsequent investigations have revealed that members of the country’s Armed Forces under the direction and command of higher officials committed these horrible crimes. They did so in order to silence Fr. Ellacuría’s publicly criticizing social injustices in the country and calling for peace negotiations to end the civil war and persecution of the poor and to leave no witnesses to the murder of Ellacuría. UCA is marking this anniversary with nine days of programs and masses. This post will discuss two of those events, and subsequent posts will cover others as they become available on the UCA website. UCA also published an essay–“Freedom and Martyrs”—by the previously mentioned José Maria Tojeira, now the Director of UCA’s Campus Ministry and the former UCA Rector (1997-2010). It focused “on one of the fundamental characteristics usually common to all martyrs, since the dawn of Christianity until today, including, of course, Romero and many other Salvadorans. This is freedom. As St. Paul said, “for Christ has set us free” (Gal 5: 1). Last week Fr. Kesicki led a visit to El Salvador by Jesuit provincials, the incoming international director of Jesuit Refugee Service, the president of the Association of Jesuit Colleges and Universities and the presidents of nine Jesuit universities. They visited UCA, participated in its forum and commemorated the martyrs at Mass at the Cathedral in San Salvador and at the Romero Chapel, where Archbishop Óscar Romero was assassinated in 1980. In addition, more than 1,300 participants from Jesuit universities, high schools and parishes converged on Washington, D.C. this weekend for the annual Ignatian Family Teach-In for Justice. It will feature a wide array of speakers and the premiere of a documentary about the martyrs, “Blood in the Backyard.” Other scheduled events include a Capitol Hill rally and congressional visits. Each of the nation’s 28 Jesuit colleges and universities also marked the anniversary with lectures, panel discussions, Masses and prayer services. The website for the U.S. Conference of Jesuits has other fascinating relevant features: (a) “Legacy of the Martyrs: Lives Changed, Causes Embraced,” that contains recollections of 38 U.S. Jesuit priests and other religious workers of what they felt when they first heard the news in 1989 of the murders of the six priests in El Salvador; and (b) U.S. Jesuits’ recollections of the martyrs. Many others have been transformed and inspired by the witness and ministry of the Jesuit priests of El Salvador. As a Christian of the Presbyterian persuasion, I too have been inspired by the Jesuit martyrs as I will discuss in a subsequent post.